Large format hardcover, bound in leather, published by Easton Press, 1984. This is a concise reprint of Werner Haftmann's book on Marc Chagall, originally published in 1973. 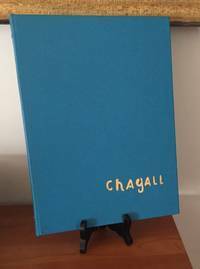 9" x 12", 128 pages, with an essay by Fermigier on the life and work of Marc Chagall, and color and black and white reproductions of the artist's work and critical analysis by Fermigier on the facing page. Blue leather with gilt edges to the text block and gilt on the embossed title on the front cover. Place holder ribbon bound in, sewn binding. We have several volumes from this series listed. This copy shows very little wear, no former ownership marks, this is not a remainder copy, not a library discard. No writing on the the text. There is age foxing spots to the last blank flyleaf and on the title page. Corners and edges of the boards show little if any wear from use, no rubbing and the corners are not bumped. As is the case for all of our listings, the attached photo is of the copy we have in our inventory, not a stock photo. Norwalk:: Easton Press,. Near Fine. 1984. Hardcover. 0810953412 . Translated from the German by Heinrich Baumann and Alexis Brown. Color and black and white illustrations throughout. Collector's edition. Quarto, fully bound in blue leather with gilt lettering, raised bands along spine, all edges gilt, sewn-in ribbon book mark. Easton Press book-plate (with no name on it) affixed to front free endpaper, else fine. ; 128 pages . Norwalk, CT: The Easton Pres, 1984. 128pp illus w/ 40 color plates. All edges gilt, silk marker ribbon, bookplate laid in. Reprint edition. Binding is Leatherbound Clean. Leather. Near Fine/No Jacket Issued. 4to - over 9¾" - 12" tall. Easton Press, 1984. Leather. Collectible: Very Good. Like New except for owner's embossed seal inside. Bound in leather with gilt lettering and decorations, and a satin ribbon page marker; all edges gilt. Nicely bound and appears unread. (Shelf location: CB2) All items carefully packed to avoid damage from moisture and rough handling. Tracking included. Norwalk, CT, USA: Easton Press, 1985. First. Full-Leather. Used; Very Good. Gilt titles on front and spine; all edges gilt; ribbon bookmark; ribbed spine.